The Department of English is one of the premier departments of the college. The department is supported by a committed team of professors who aim at effectively delivering a course in English, which is renowned for uniformly maintaining its standards of academic excellence over the years. The quality of students in the undergraduate programme is commendable. of texts, authors, movements, literary trends, theories and schools of criticism. It encompasses a study of the history of English Literature together with intense analysis of representative works of eminent authors, dramatists and poets such as Shakespeare, Milton, Dryden, Pope, Jane Austen, Dickens, Shaw, Romantic, Victorian and modern poets. The final semester offers courses in specialized areas such as Modern fiction, poetry and drama together with American Literature. Strategies of teaching include lecture method, audio-visual techniques, student seminars, term papers and class discussions. This course is a full time course. The duration is for three years programme leads to the award of the degree of Bachelor in English. (B.A. English Honours). Limited seats are available in each subsidiary subject. Hence one may not get the desired subsidiary subject as the selection will be done on merit basis. Study in Geography is divided into four major thematic areas: Human Geography, Physical Geography, People-Environment, Cartography/GIS. In addition, students may focus on Area Studies and Global Systems as part of one of the thematic areas. The Geography Department faculty serves in prominent positions both within the college and in our larger professional communities. Our faculty have been recognized both by the university and within our profession.We are also proud of the accomplishments of our graduates, many of whom have gone on to prominence within government, industry, and academia.The Department of Geography offers undergraduate programs, and postgraduate programme in Geography. The department of Political Science is a part of the glorious heritage of St. Xavier's College. As a community of Students and Faculty, the Department is committed to academic freedom and equal access to education. The department of Political Science is adequately staffed with highly competent faculty. Three out of five members have been awarded their Doctoral Degree and others are in the process of completing their work. The competency of the faculty is proved every year by virtue of the results of the students and the placements they receive at the National as well as International level. The relatively young department of sociology has been successfully able to carve a niche for itself in a short span of time since its inception in 2015. The department of Sociology aims to engender analytical and critical thinking among its students and has continuously endeavoured to incorporate the most contemporary debates in Sociology in its academic curriculum. The entire syllabus was restructured in light of changing trends in sociology both at the conceptual and methodological level. It was felt that the changes could not b affected without parallel changes in he curriculum. So while the monological method of teaching continued, it was supplemented with various kinds of practical exposures. Village trips were therefore organized for every batch of students so tat students learn how to relate theory with facts, not only that the village exposure helps the students to develop a perspective which they would not have attained otherwise. Welcome to the Department of Physics of St. Xavier's College, Ranchi. We have faculty with interests ranging from experimental to theoretical aspects of condensed matter physics, optics, spectroscopy, image processing, field theory and quantum computation. The department is supported by UGC. 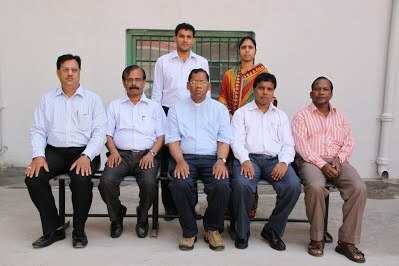 The present faculty members are highly dedicated for quality physics education with innovative methods of theory teaching & practices and inspiring & guided laboratory classes.. . The Department of Chemistry is a multi-dimensional centre for study and understand in Chemistry.The department offers three years B.Sc.degree in Chemistry Honours.Provides a substantial Chemistry background to supplement other disciplines.Gives exposure to state-of-the-art instrumental techniques. The Department of Chemistry of St Xavier's College offers a dynamic and cutting-edge educational experience in the chemical sciences. The Mathematics Department of St. Xavier's College is proud to be the inheritors of a glorious heritage.He has been a constant source of inspiration as well as the driving force behind this Department for nearly five decades. Generations of students and teachers have enjoyed the warmth of his loving care and benefited from the erudition of this apostle of Mathematics.Through a diversity of undergraduate and graduate courses, we offer our students a first-rate mathematics education that challenges them to become critical thinkers, prepares them for exciting careers and inspires them to be the creative problem-solvers of tomorrow.We help our students become critical thinkers and creative problem solvers and to prepare them for careers in exciting and rapidly expanding fields. Our young, ambitious department has a well-developed Mathematics Learning Center to provide students with any additional support needed to succeed. Our department also stages a wide range of extracurricular seminars to encourage and stimulate students to expand and develop their mathematics skills and interests.Many of our students choose to major in mathematics. However, for those students who are simply looking to develop a strong math background to supplement a different major, we offer very popular minors in actuarial mathematics and in applied and computational mathematics. The Department of Botany is a well-established Department in the Faculty of Science with a reputation for maintaining high academic standards and a strong research culture. The Department has taken a conscious effort to expand its teaching programme bringing together novel developments in the field with traditional areas of Botany.Teaching in the Department are amply supported by its infrastructure with modern lecture halls, fairly well equipped laboratories, glass house, plant house and herbarium facilities, books and periodicals.Our mission is to strive for an excellent environment for learning and research in plant sciences and produce graduates equipped with skills necessary to fulfill their role in contemporary society. Zoology is the study of living organisms, specifically animals. Zoologists study multiple species in a certain ecosystem, population interactions, and specific species or behaviors. They collect and analyze data in labs or outdoor environments.it has been the foremost centre for learning in all aspects of Animal Sciences in India.Initial teaching efforts in the department was tailored to train students leading them to a B.Sc. degree. This course is about animals – their evolution and diversity, and the methods we use to study them. It will give you an overview of how the form, function and behaviour of animals are adapted to their lifestyle and their environment. The course comprises five half term sections in Behaviour and Ecology, Brains and Behaviour, Insect Biology, Vertebrate Evolutionary Biology, and Evolutionary Principles. You will be taught by lecturers who are actively researching in these fields, and the breadth of topics, questions and approaches of IB Animal Biology will allow a broad range of choices for your third year studies. The department of Geology been playing role in nurturing the Geosciences education in this mineral rich state of Jharkhand. Our undergraduate and graduate students gain a strong foundation across the geosciences. Areas of specialization may include environmental and isotope geochemistry, applied geophysics and tectonics, paleoclimatology, planetary science, remote sensing and GIS, volcanology, and human-environmental interactions. As Geologists, we are responsible to locate and assist in the extraction of mineral deposits such as gold, metallic ores, coal, petroleum and even building materials and economically useful clays. More common but vital materials such as stone aggregates for making concrete and road building, limestone for the cement, fertilizer and chemical industries, and sand for building or glass manufacture.The laboratories in the Department are moderately well equipped with sophisticated instruments to support high quality teaching and research. The Department has a well maintained Museum that has a display of rocks, minerals and fossils from type areas and other geologically important horizons in India and abroad collected by its faculty members and research scholars.Outlook for employment in the Department is at its all-time best Geology jobs are more than just exploration for oil and mining: understanding geology underpins diverse efforts in urban planning, environmental restoration, analytical and research laboratories. So our graduates with a strong Geology training can confidently look forward to employment opportunities in a wide assortment of industries in addition to research funding institute. The Department of commerce at St. Xavier's College enjoys a pre-eminent reputation for the excellence of its teaching in this dynamic discipline. It ranks alongside the most highly-rated departments in commerce among the undergraduate colleges of this state. From a very humble beginning, today it is the biggest department of the college catering to more than 3000 students. Our academic program is of the highest caliber because we believe in the transformative power of ideas. Our faculty, and diverse student body from various social walks of life, all contribute towards the same purpose: to maintain the department's excellent reputation in education at the cutting edge of economic, institutional and organizational aspects of commerce. Traditionally, Statistics has been defined as a body of scientific methods used for collection, classification, presentation, analysis and interpretation of numerical data originating from diverse fields. The success of the subject therefore lies in its application. Perhaps there is no branch of scientific knowledge where Statistics has not left its imprint. The mission of the Department is to lay the foundation of intellectual leadership in the subject that is of direct benefit to the state and country at large. To this end the department is committed to offering a well-rounded academic program, the specific goals of which include: It was since 2015 that the department started offering Honours courses.